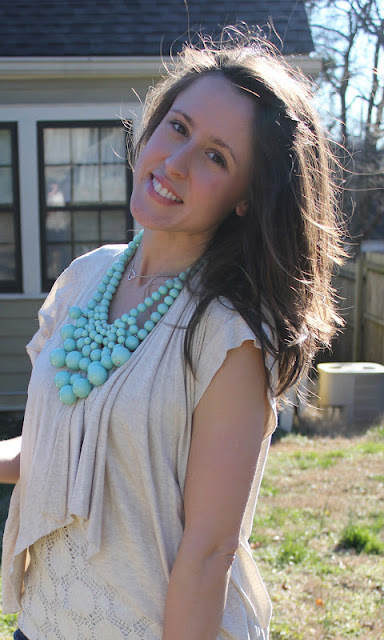 In the past there have been some very kind compliments about my favorite ModCloth Mint Bib necklace. I actually stalked this necklace online for a few months, waiting for it to be re-stocked, to purchase it for a friend... but after the months of anticipation and the joyous click of the "purchase now" button, I was too smitten to gift it when the wonder finally arrived (sorry Mich!)... and have been loving it ever since. 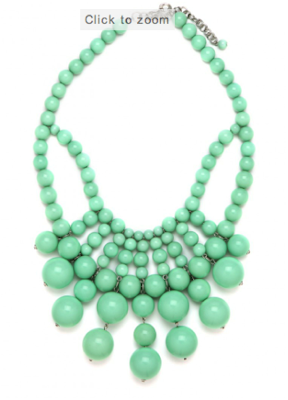 The said necklace is no longer sold on the ModCloth website, but Bauble Bar has released a very similar "Spearmint Bauble Bib" which can be yours by early June (pre-order) to the tune of $36 dollars! LOVE the necklace! Thanks for sharing, Jessica! LOVE these big baubles- this one is so adorable on you! oh that is a really nice necklace, I bet Tangerine is going to be gorgeous too! It would look so nice with just a simple white tee also! Love the Necklace ,you look gorgeous! this necklace is awesome!! and i am guilty of not giving a gift I've purchased for someone because I kept it for myself! ha, isn't that so funny when it happens?! i cannot tell you how many times i have boughten something for someone and end up just keeping it for myself. too funny! What a beautiful necklace! I would've kept it for myself too! Thanks for the tip, I will be checking out the Bauble Bar website. I've been stalking this necklace too! Everytime I see it I fall in love all over again!! Ahh that necklace is amazing!! Love it. It looks so pretty on you! love it! the color is so great.